You enjoy access to quality CME programmes at reduced member rates; you can learn about the latest ideas and innovations from researchers and manufacturers; you can apply to prestigious national and international travelling fellowships; or you can connect with leading thinkers in orthopaedics. And you receive a quarterly Bulletin that will keep you up to date on current events and ideas in orthopaedics. So join your peers. 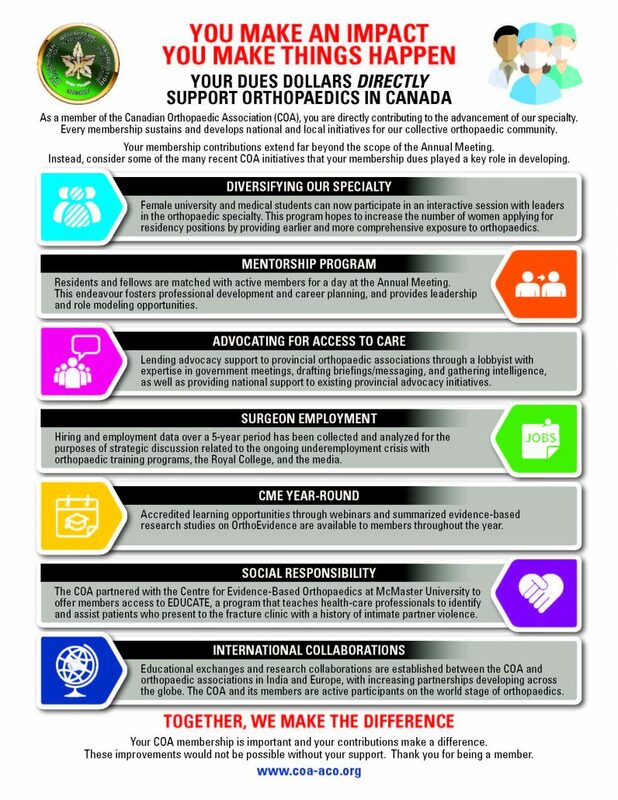 Become a member of the Canadian Orthopaedic Association. We value your membership. We’re working for you. What Are Your COA Membership Benefits? Annual Meeting registration fees are waived during the pre-registration period for Active members practicing in Canada whose membership is in good standing and for Associate (resident/fellow) members of the COA. Considerably reduced registration fees are offered exclusively to Active members practicing in the United States or overseas as well as for our Research Affiliate and Senior member categories. Subscription and publishing opportunities in the COA Bulletin, the online quarterly journal of the COA. Weekly e-newsletter, the COA Dispatch where members can promote courses and events in your centre, request participation in a research survey or share news of interest with your colleagues. Free subscriptions to both the Bone & Joint Journal (formerly JBJS Br) AND Bone & Joint 360. The BJJ covers the most clinically challenging areas in orthopaedics and provides the very best information required for each orthopaedic subspecialty. Bone & Joint 360 is a digest journal designed to keep you up-to-date across all areas of orthopaedics. Complete access to myorthoevidence.com. OrthoEvidence is an online provider of the highest quality orthopaedic evidence providing instant access to summaries and appraisals of the best available research. Access to job listings in the COA Job Board where members can advertise an available position in your centre at no charge or be notified when a new job is posted online. Travelling Fellowship opportunities are available to COA members exclusively. By attending a COA event or meeting, members gain valuable networking opportunities with their colleagues from across the country. The COA represents the viewpoints and best interests of the orthopaedic community with provincial and federal Health Ministries, the Royal College, the Canadian Medical Association and other key stakeholders. Strength in numbers to address major concerns in the profession, such as the current underemployment of surgeons across Canada. Members are encouraged to take a leadership role in local advocacy efforts, using tools at your disposal through the COA web site. There are no annual membership dues for resident and fellow members as well as for our senior members who have retired from active clinical practice. Orthopaedic graduates who are not yet in a full-time position are also not charged any annual membership fees. Dues are then decreased by 50% during your first year of active clinical practice. 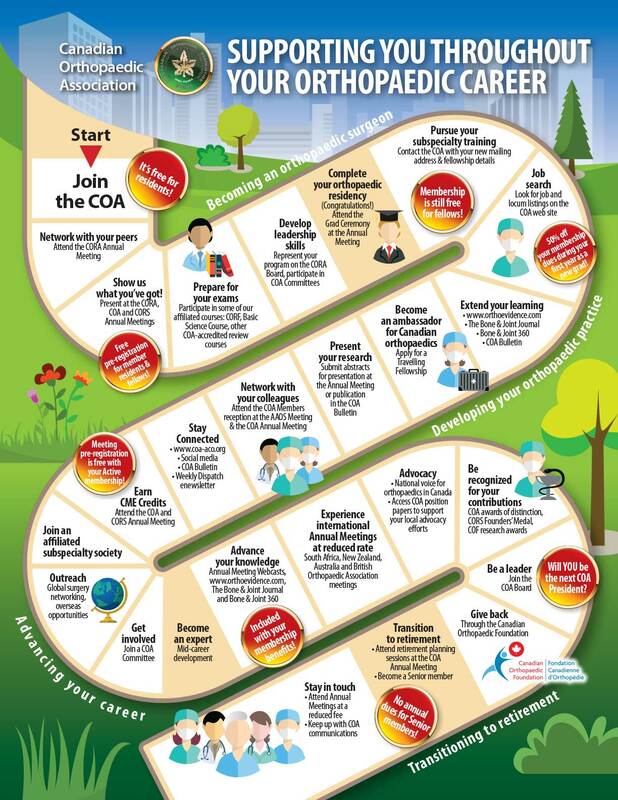 COA membership is a now a prerequisite in order to join several Canadian subspecialty societies. Active members practicing in Canada as well as Associate members of the COA receive free online access as well as discounted print access to the Bone & Joint Publishing journals (formerly JBJS British Edition) through their COA membership. The Bone & Joint Journal (formerly JBJS Br) l covers the most clinically challenging areas in orthopaedics and provides the very best information required for each orthopaedic subspecialty. Bone & Joint 360 is a digest journal designed to keep you up-to-date across all areas of orthopaedics. Bone & Joint Research is the gold open access journal for the musculoskeletal sciences. EFORT Open Reviews is an open access journal publishing instructional review articles across the whole field of orthopaedics and traumatology. Journal of Children’s Orthopaedics is an open access journal that focuses on clinical practice, diagnosis and treatment of disorders unique to paediatric orthopaedics. OrthoEvidence (OE) is THE global content provider of the best evidence in orthopaedics. Through their web site, they provide complete summaries of the best orthopaedic research, updated daily. More than 30,000 practitioners and surgeons from more than 150 countries use OrthoEvidence because they provide a huge offering of summaries from more than 360 journals, they summarize only the VERY BEST (top 5%) evidence in orthopaedics all in one place (so you know the information you are reading is good), and they provide summaries that identify clinical implications, and are easy to quickly read and utilize in practice. What does OE give me? Access to a breadth of content from 300+ journals and 13 different specialty areas including Trauma, Sports Medicine, Spine, Arthroplasty, Foot & Ankle, Shoulder & Elbow and more. Access to summaries of research presented at major conferences from across the world including the COA Annual Meeting and AAOS! Access to OrthoEvidence’s PeerView feature which allows you to quickly see the most popular research as read by orthopaedic surgeons from around the world. Your very own Fast Track program, which will send you the most viewed content by COA members every month in the areas most important to YOU! Haven’t received your OrthoEvidence account information? Contact info@myorthoevidence.com to get setup with your personal account today! Want to get involved with the OrthoEvidence Editorial Board? Contact info@myorthoevidence.com if you want to learn more! We are very pleased to announce several new elements to the COA member benefits program, in partnership with two of Canada’s largest and most respected institutions: RBC Insurance and Sun Life Financial. *EFPS team members are salaried planners and unable to sell or receive compensation from the sale of any insurance or investments products. RBC Insurance, Canada’s leading provider of disability coverage to specialist physicians, will now offer 25% discounting for COA members. In addition, COA members have access to disability specialists who can offer assessments of current coverage, complex coverage design, and also advise on business and overhead coverage for professional corporations. Sun Life Global Investments (SLGI) has provided preferential access to their Private Client platform, which offers reduced fee structures, full disclosure reporting and statements, as well as holdings from many of the world’s top investment firms including Mawer, RBC, Fidelity, Beutel Goodman, Sentry, Templeton, Invesco, MFS, and more.